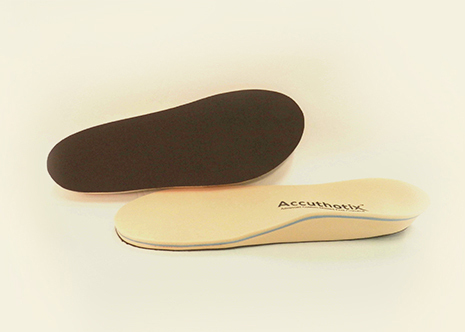 ACCU- FLEX I,II and IIIUSAGE: A rear foot controlled, flexible orthoses for the patient that is active but needs substantial shock absorption. This is our most popular cross trainer device and works well for patients involved in racket sports, basketball and the serious walker. This orthoses also works well in a work boot. 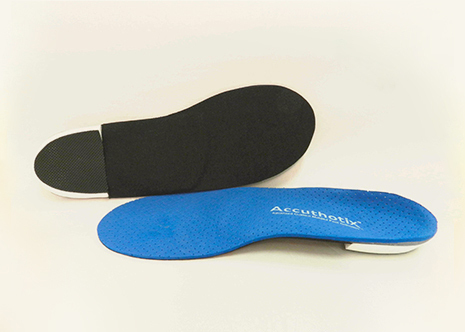 ACCU-TRUE RUNNER I, II, IIIUSAGE: This orthoses provides moderate control of subtalar movement. Three flexible material thicknesses allow different degrees of control. This orthoses is extremely light weight and fits well into running shoes and sport cleats with a minimal amount of bulk. Best suited for the true runner and athletes using cleats for sport such as soccer, lacrosse, baseball, golf etc. 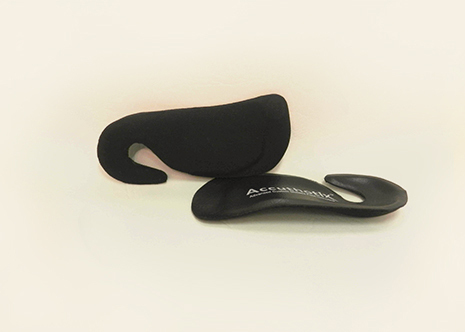 ACCU-KIDSUSAGE: A fully functional device with mild, moderate or semi-rigid control for pronation or supination. Children with flexible deformities can tolerate more control of the sub-talar joint. ACCU-UCBLUSAGE: For the pediatric patient who presents with severe Pes Planus. This orthoses provides a fully molded heel cup and high medial and lateral flanges to stabilize this flexible deformity. BOTTOM COVER: Black suede – we recommend ¾ length. A standard dress orthoses used in all applications for patients needing control. ACCU-DRESS-MENUSAGE: A standard dress orthoses used in all applications for patients needing control. Indicated for plantar fasciitis, achilles tendonitis, excessive pronation or supination, and first metatarsal phalangeal joint pain. Best orthoses for men who need a dress orthotic for loafer style, oxford type shoes and dress boots. 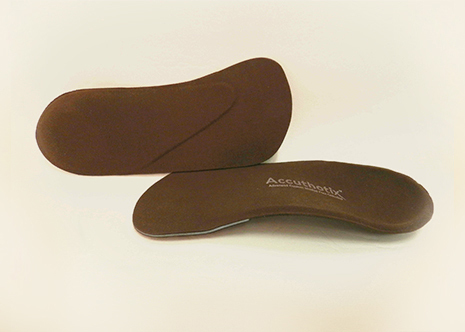 ACCU-CASUAL-WOMENUSAGE: Manufactured to accommodate a low heel up to 2 inches for women who weigh less than 165 lbs. 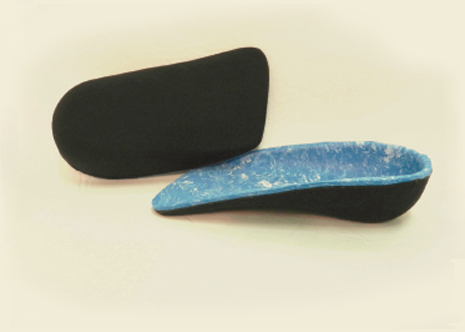 This orthotic shell is tapered towards the first MPJ or tear drop shape allowing for control of the medial longitudinal arch and full heel control. 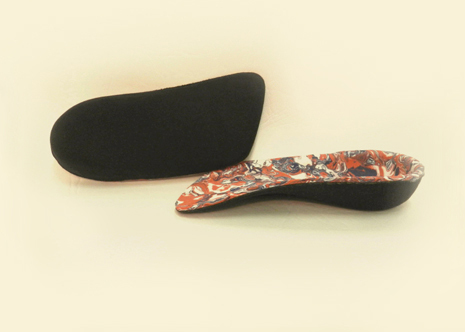 ACCU-CASUAL-WOMEN-PLUSUSAGE: Manufactured to accommodate a low heel up to 2 inches for women who weigh over 165 lbs. 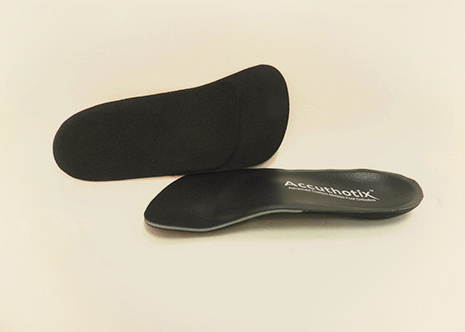 This orthotic shell is moderately flexible to semi-rigid to support the patient’s weight. 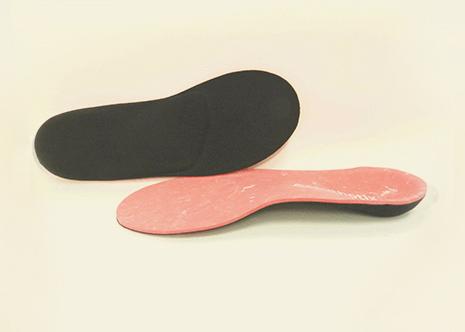 This orthoses provides maximum support for the medial longitudinal arch and full heel control. BOTTOM COVER: Black suede – we recommend sulcus length. ACCU-COBRAUSAGE: This classic cobra-style design is a multi-functional device manufactured and engineered to fit comfortably in women’s dress shoes – especially heels more than 2 inches high. The cobra pattern allows for the calcaneous achieving maximum depth of the shoe. 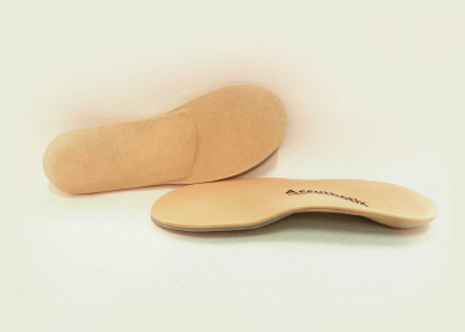 This allows the counter of the shoe to fit the patient’s heel correctly. ACCU-DIABETICUSAGE: For patients who may only be able to tolerate a mild amount of control for pronation or supination. This devise achieves comfort and relief of ulcerative pressure usually seen with the diabetic patient. For patients who can tolerate a moderate amount of control for pronation or supination. 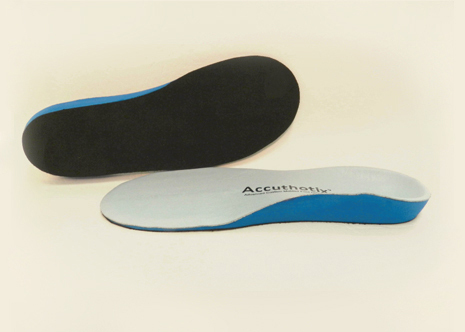 ACCU-DIABETIC-FIRM USAGE: For patients who can tolerate a moderate amount of control for pronation or supination. This achieves the comfort and relief of ulcerative pressure seen with the diabetic patients. ACCU-CLOUD IUSAGE: An accommodative device for senior patients who cannot tolerate too much control of the sub-talar joint. 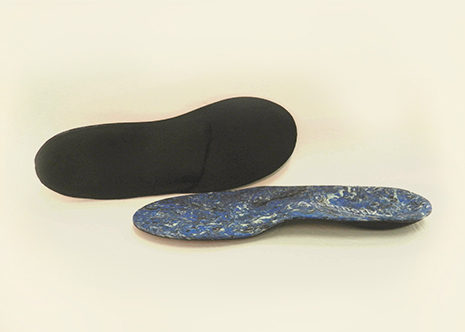 The primary goal of this orthoses is to disperse the forces within the foot to create comfort while attempting to counter the over pronated or supinated foot. Recommended for the senior patient who may have a rigid deformity such as an arthritic condition. ACCU-CLOUD IIUSAGE: An accommodative devise for the senior patient who can tolerate mild to moderate control of pronation or supination. Recommended for the senior patient with a relatively flexible deformity. ACCU-SOFT IUSAGE: A device for patients with more tolerance of semi-rigid device. Moderate control with maximum comfort for an accommodative device. 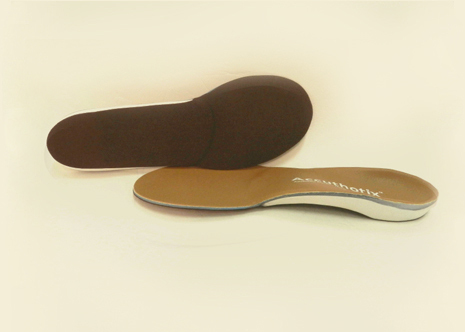 Orthotics recommended for seniors that weigh less than 165 lbs. ACCU-SOFT IIUSAGE: A device for patients with more tolerance of semi-rigid device. Moderate control with maximum comfort for an accommodative device. 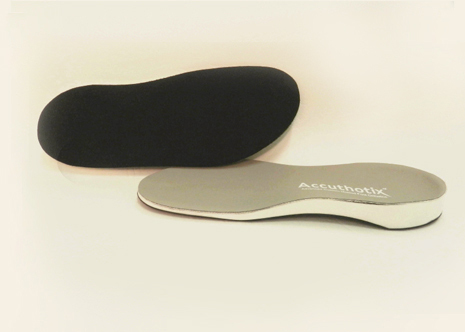 Orthotics recommended for seniors that weigh more than 165 lbs. 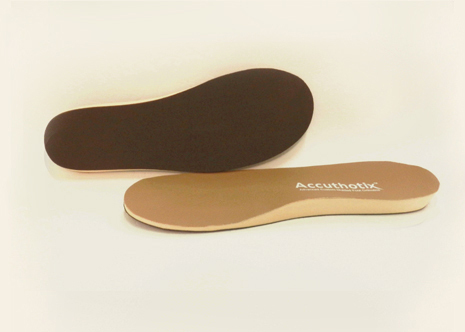 Orthotics recommended for severe pronation control and firmness. USAGE: This orthoses works extremely well for the patient who prefers to wear a comfort shoe like a walking shoe or a slip on type shoe.MATERIAL: A polypropylene shell with a moderately deep heel cup to provide maximum support of the medial and lateral arches of the foot and heel control.POSTING: Intrinsic posting to allow for the variety of shoe styles in the “comfort “category and to reduce the weight of this orthoses.TOP COVER: 3mm pink EVA top cover for shock absorption and durability. BOTTOM COVER: Black suede – we recommend full length. 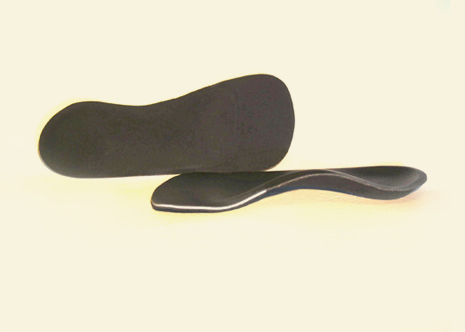 USAGE: This orthoses works extremely well for the patient who prefers to wear a comfort shoe like a walking shoe or a slip on type shoe.MATERIAL: A polypropylene shell with a moderately deep heel cup to provide maximum support of the medial and lateral arches of the foot and heel control.POSTING: Intrinsic posting to allow for the variety of shoe styles in the “comfort “category and to reduce the weight of this orthoses.TOP COVER: 3mm black and blue swirl EVA top cover for shock absorption and durability.